The Cutting Edge Issues in Development Thinking and Practice series started off with a great first lecture in the new term, given by Erinch Sahan of the World Fair Trade Organisation. During the 90-minute lecture, Erinch discussed the question of whether business can be more than a profit maximiser. In this article, two of the Department’s students share their thoughts about the lecture with us. The business of business is business. But is it though? Famous economist Milton Friedman wrote in an article that the only social responsibility a business bears is to increase profits for shareholders. Of course, this was back in the 1970s and a lot of organizations have clearly extended the very definition of social responsibility since then. Today, global income inequality still remains a major problem, arguably caused by globalization and offshoring. It is also a time where we seriously need to think about the impact we have on our planet. The rise of CSR projects and green initiatives undertaken by corporations has become much more prominent, but can the very nature of business be conscious of the environment and disadvantaged communities whilst not compromising potential profit maximization opportunities? A lot of these questions were addressed last week at the lecture given by Erinch Sahan who currently serves as the chief executive of the World Fair Trade Organization. The WFTO is a global community of Fair Trade Enterprises with over 400 members across 70 countries. Member organizations believe in the changes of supply chain management in favor of creating more equity and justice within international trading structures. Overall, the organization aims to improve the livelihoods of disadvantaged communities in developing countries by creating a fairer and more inclusive way of doing business that benefits all stakeholders. Throughout the lecture, Sahan touched upon a wide array of subjects, such as addressing the question of whether there is a business case for CSR, which still a lot of CEOs don’t believe exists. He briefly also addressed the current state of business and how we are severely operating outside of our planetary boundaries. 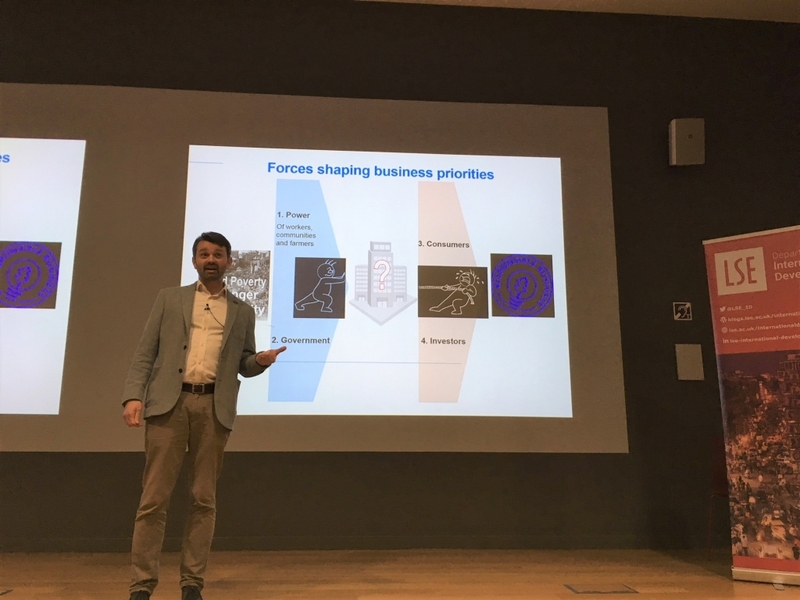 Unsurprisingly, he used Kate Raworth’s concept of the “Doughnut” from her book “Doughnut Economics”, something I personally thought was quite cool since not too long ago she gave a lecture on the very same topic in one of our Cutting Edge Lecture series. Looking at the state of business today, there’s a clear trend towards being more environmentally and socially conscious when making business decisions, however; organizations, especially publicly traded corporations have the fiduciary responsibility to their shareholders to maximize profits – which most of the time can come at the cost of the planet or marginalized communities. To truly change the trajectory of doing business towards a more responsible and inclusive way, Sahan stated that the very meaning of shareholder value and the concept of win-win needs to be addressed and possibly changed. What is a win-win situation? How do we define a win? Once we find new answers to these moral and perhaps philosophical questions, we might be able to not just think within monetary terms but also include social and ecological well-being into the equation of shareholder value. Sidney Trompell is an MSc African Development candidate at the LSE. In the past he has worked on various entrepreneurial projects within Kenya and the UK. He is interested in how productive entrepreneurship can positively affect political institutions within East Africa. The primary objective of the private sector has been to maximise profit. This logic has defined the mission and operation of firms. As a result, they have not taken into account their impact on inequality, ecological crises, poverty wages, consumers, the community and the global economy. Erinch Sahan gave an engaging talk about this topic, beginning with the problem of what causes it, explaining the possible solutions and ending his lecture with some examples of fair trade companies. According to Erinch Sahan, income inequality is the main problem. While productivity has grown, wages have not increased at the same rate. Those who own the capital are able to extract the value and accumulate it. The working force does not have the opportunity to get part of the profit. Having money makes more money than working. While in the 1970s shareholders got 10% of profits, nowadays they get 70%. As a result, inequality increases, creating instabilities and injustice. The causes, as presented by Erich, have been that governments fail to regulate, consumers want cheaper goods and services, unions have lost power, and there is a lack of diversity in companies’ leadership. Additionally, there is less competition because corporations are getting bigger and concentrate a lot of power, while shareholders and CEOs are inactive. This can be solved by changing the DNA of corporations. The mission of firms should go beyond profit maximisation. We can suggest to investors to run a different business model in order to have a different and better economy. They can win more if they solve problems like poverty, hunger and inequality. Alternative business models are on the rise. They are more diverse with regards to gender and play an active role in solving the big problems of society because their mission is to benefit the people, the environment and the community as a whole. The World Fair Trade Organization (WFTO) is a movement promoting Fair Trade Enterprises which have as their mission to put people and the planet first, as opposed to maximizing profit. It involves changing the structure, purpose, behaviour and impact of the private sector. The effect is what really matters. The mission and structure of corporations should have a positive impact on people and the environment. Erinch Sahan suggested that the business DNA can be changed if the community is involved in the decisions companies make, workers and farmers are represented in the board of managers, profits go to social programs as well as workers or farmers, and if there are collective ownership and legal frameworks that support these changes. At the end of the talk, Erich presented interesting firms from each continent that support fair trade. As examples, he mentioned El Puente from Germany, Cojolya from Guatemala, and Selyn from Sri Lanka. An inspiring message was that we can live in a different and better world if companies think differently, as these companies have changed the lives of many people by making more room for positive impact in a changing world, and we can help to promote it. Enrique Forero is an MSc Development Studies candidate. He graduated from economics and industrial engineering. Given that he has worked in promoting innovation, investment and exports, his research interest is on these topics and their impact on development. On Friday, 25 January, Claire Hutchings from Oxford Policy Management will be giving a talk on “Counting what counts: The art and science of measurement in aid and development”. The lecture takes place from 4-6pm in the Sheikh Zayed Theatre in the New Academic Building. The series is open to LSE Students and Faculty. Other external guests should visit https://bit.ly/2AxvWVG to reserve a seat.